Have you seen Dang and Darn in your garden? Whenever you start to garden, whether it is at the beginning of the season or for the first time in your life, they show up in the first five minutes and then they stay forever. Dang is not hard to find, if you just take a minute to look in your GArDeN. Darn is just as easy to spot in your gARDeN and is often with Dang. I have a lot of examples of Dang and Darn in my garden. Sometimes they are together, Dang and Darn, and sometimes they operate alone. 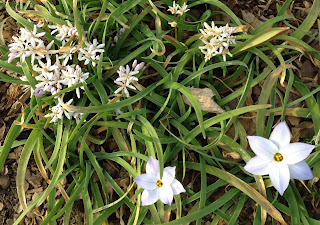 Dang, I wish I could remember the name of those little white flowers in the picture above. Glory of the Snow? Is that the common name for Chionodoxa gigantea alba? Dang, I'm not saying that outloud. I do remember that the other flower is Ipheion uniflorum,with a common name of Starflower. Dang, I wish I had spent more time weeding the vegetable garden late last fall. It's going to be a mess to clean up now with all those Darn weeds. And there's a lot of Dang out there because I haven't rebuilt the Darn raised beds. It just goes to show that Dang and Darn do like to hang out together. Though, I keep reminding myself that I only have to build one raised bed by March 17th so I can sow seeds for peas. I can build the rest of the raised beds after that. Dang, I wish I could find a couple of flats of old-fashioned violas. I'd plant them along the path in the woodland garden. They would add some color there for the big Easter egg hung. I just didn't plant enough Darn bulbs along that path. Dang, I need to call someone to remove that Darn suckering Viburnum out in The Shrubbery. If I don't I'll be danging it all summer-long. Dang, no one wants that to happen. I could go on about how much impact Dang and Darn have on my garden, the mischief they cause, the antics they do. There are countless examples. I'm sure others have Dang and Darn in their gardens, too. Some see them more, some see them less. But no one escapes these two. It doesn't matter how good or experienced a gardener you are, Dang and Darn are there in your garden. The trick to gardening with Dang and Darn is just that, to garden with them, accept and embrace them, If you do that, it lessens their power over you. Oh, and if you laugh at Dang and Darn? Try that, you won't believe what will happen. Dang and Darn will actually become your friends. Dang and Darn are alive and well here, too Carol. They are helpful reminders of what needs doing, they need to be on the jobs list as they show up. That doesn't mean they will get done, just that you don't have to try and remember anymore. The 'twins' Dang and Darn are here on occasion. They keep me humble. Excellent observations Carol. Much better words than their cousins who show up when things go really bad. I fear Dang & Darn's cousins are more frequently heard in my garden! Yes, Dang and Darn live in my garden, running, hiding, and laughing at me! Good to know I'm not the only one cursed with these two mischief makers! I've already found a few dangs and darns this season. As in this morning when I couldn't see too many tulip and daffodil bulbs coming up in my new flowerbed: "Darn, I hope the dog didn't dig them up or squirrels get to them last fall." If that turns out to be true, one of "dang" and "darn's" bigger cousins will probably join them! As usual, a thought-provoking post. I've been unofficially calling them "mumbles," ascribed to things that crop up--or don't show up--as the case may be each spring in my garden.